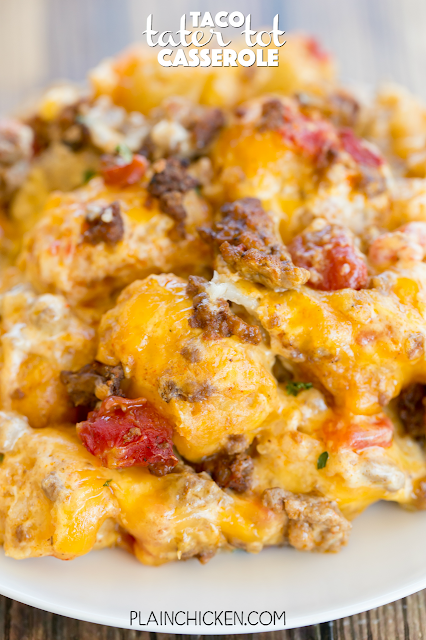 Taco Tater Tot Casserole - taco meat, diced tomatoes and green chiles, cheese, cheese soup, sour cream and tater tots - what's not to love? We ate this twice in one day! Can be made ahead of time and refrigerated or frozen for later. You can also divide it between two 8x8-inch foil pans and freeze one. Taco night will never be the same! This Taco Tater Tot Casserole was a nice change to our usual taco night. Taco meat, cheese, diced tomatoes and green chiles, sour cream tossed with tater tots. I mean, what's not to like! This casserole can be made ahead of time and frozen or refrigerated overnight. I like to split the casserole into two 8x8-inch foil pans. I bake one and freeze one for later. 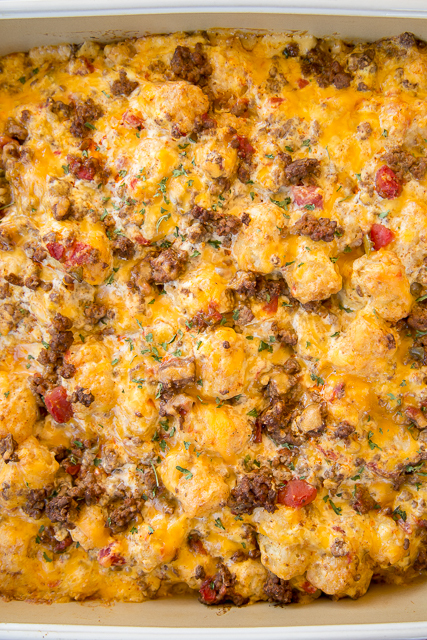 We both LOVED this Taco Tater Tot Casserole. We ate it for dinner and leftover for lunch the next day. It was delicious both times! Feel free to top the casserole with your favorite taco toppings - lettuce, tomatoes, olives, guacamole, more sour cream. Get creative! Cook ground beef in a large skillet until no longer pink. Drain fat. Stir in taco seasoning, diced tomatoes and green chiles and water. Simmer for 5 minutes. In a large bowl, combine cooked beef, cheddar cheese, tater tots, cheese soup and sour cream. Mix until throughly combined.